Let me be clear about the kind of growth I am talking about here -- growth in the burden that a human society places on its environment. This increase may happen due to an increase in population or due to increases in the rate of consumption by the members of that population or a combination of both. In our modern world it is very to easy lose sight of the fact, but all human societies are completely dependent on the natural environment for the necessities of life -- air, water, food, the raw materials from which we build our machines and the energy which runs them. That environment is finite in size and has a limited carrying capacity. Material resources in convenient forms exist in finite amounts and when "used up" they tend to be converted to forms that are no longer useful and in many cases are downright harmful to both us and the environment. Energy flows into ecosystems in the form of sunlight and is converted into wind, falling water and biomass, but the rate at which that energy flows is fixed. By tapping into various forms of stored energy we can temporarily access energy at rates greater than the rate of solar influx, but like any other material resource, when those resources are used up, they are gone. (Yes, I am ignoring deep geothermal and tidal energy but that's a discussion for another day). It also seems that human societies have a tendency to grow until they come face to face with the limits of their environments. In pre-industrial societies food and firewood were frequently the limits first encountered, as forests were cut down and agricultural soils were depleted by erosion, salination or simple depletion of nutrients. We know very little about pre-agricultural societies but it is a suspicious coincidence that many species of large animal went extinct around the same time that our ancestors became really good at hunting... Of course, hunter-gatherer populations were so small in relation to the environment as a whole, that in many cases when one area was depleted, they could simply move on to another. Agricultural societies are for the most part sedentary and when they run into the limits of the land they occupy, the results tend to be more ugly. When agricultural societies are successful, they grow and eventually they do deplete the resources on which their success is based. Very rarely has an agricultural society lasted in one location for an extended period of time. Read books like Jared Diamond's Collapse, Joseph Tainter's Collapse of Complex Societies or Ronald Wright's A Short History of Progress, for more on this theme. Why is this so? Why does resource depletion sneak up on growing societies and catch them unaware? I think at least part of the answer is to be found in mathematics, in the shape of the curve that growth follows. The sort of growth we are talking about, growth in populations of living organism, is exponential. That is, a population grows as percentage of its current size. Growth starts out slow -- the curve stays almost level for a long time. Then it reaches a "knee" where it starts to turn more rapidly upward and soon it turns almost vertically upward, growing at a rate that no finite container can accommodate. So of course what happens is that as the resources that were sustaining the growth are depleted, growth decreases. Often the resources have been depleted to the point where they cannot support the current population. This situation is known as "overshoot", and sadly, it is followed by "dieoff", where some portion of the population does not survive and numbers decrease to the level which the depleted environment can support. This situation always seems to come as a surprise to those who are living it. Everything has been going along just fine and as we edge onto the knee of the graph, it seems to going even better. Growth in the population, and in the standard of living for at least some of its members, seems like an achievement, a goal that they have been striving for and more could only be better. Very shortly, this is proven to be wrong. 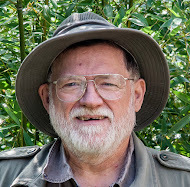 It is the sudden change from times of plenty to collapse, as a result of resource depletion due to exponential growth in a finite system, that always seems to come as a surprise. For the last couple of centuries our western society and more recently most of the world has been in a unique situation. We have tapped into the stored energy of fossil fuels, not just as a source of heat, but also a source of mechanical power to replace human and animal muscle power. This has enabled huge growth in our population and in our standard of living. Peat and coal had been used to a small extent as heating fuels for many years, but came into greater prominence in the 18th and 19th centuries. In the twentieth century oil and natural gas took over as our primary sources of energy. Oil is a particularly unique resource. It is a concentrated source of energy, and as a liquid, quite easy to move around and to store. Early in the history of its use, oil was to be found near the surface and often under pressure, so getting it out of the ground was easy. The EROI (energy returned over energy invested was high -- as much as 100 barrels of oil could be had for an energy investment equivalent to only one barrel of oil. And early in its history the rate of discovery had no trouble keeping up to or exceeding the growing demand, so it was easy to think of oil as an essentially infinite resource. I don't think anyone really thought of the oil supply as literally infinite but the prospect of it running out was so far in the future that there was no point in worrying about it at the present. There was ample time for future generations to find a replacement. That kind of thinking has a way of catching up with us, though. Even today one sees naive calculations that there is enough oil left to last us 20, 30, even 40 or more years. And for many people, that is equivalent to saying that there is lots left and someone in the future can worry about what to do when it runs out. But calculating when oil supply is going to be a problem is not as simple as dividing the known reserves by the rate of annual use and coming up with a number of years. Say your car gets 40 miles to the gallon and your gas tank has 10 gallons in it. You should be able continue cruising merrily along, for the next 400 miles, right? This is because your car's fuel line and fuel pump have been designed to always be able to keep up with the rate at which the car's engine uses fuel. There is never any worry that you might not be able to get fuel to the engine fast enough, right up until the moment before the gas tank eventually runs dry. Unfortunately, oil wells don't work like that. An oil well does not tap into some pressurized underground tank of oil, but rather drills down until it reaches porous rock that is saturated with oil, often under pressure because of the weight of rock above it. The output from a single oil well rises quickly once you "strike oil", then levels off at some maximum rate and finally begins to decline. 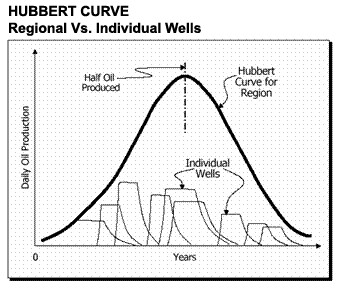 Add together the production rates of all the wells in an oil field, or country or in the world and you get the classic Hubbert curve. This diagram came from The Peak Oil Primer at the Energy Bulletin website. It's well worth reading that page, if for no other reason than I am not going to go over the basics of the subject here. It is interesting to note the similarity of the Hubbert Curve to the exponential growth curve I was talking about. The same sort of surprise is built into it -- we're just beginning to get going really well, then we reach the top of the curve and the bottom falls out from under us. And note that, in the case of oil, this happens when roughly half of the oil is still in the ground. It is not the amount that's that left in the ground that counts, but the rate at which we can pump it out of the ground and how much it costs, both in terms of dollars and energy, to do so. Our society's continued well being is based on economic growth. That growth is driven by the ready availability of cheap energy in convenient forms -- mainly oil. Around 85 million barrels a day of oil as things stand at the moment (February 2012). It is interesting to note that that number has not grown for the last five years. And during those years our economy has been essentially stalled. The oil supply has become "in-eleastic". That is, demand goes up, the price of oil increases, but the supply does not increase. In fact, when the price of oil increases, the economy actually slows down and demand decreases to match the available supply. If you delve a little deeper into Peak Oil theory, you will find that the peak of the curve is more like a "bumpy plateau". It's pretty clear that we have been travelling along that plateau for several years now. What remains to be seen is when we will start down the declining side of the curve. Very likely the smooth decline portrayed on the graph is a convenient fiction which makes the curve easier to draw. I expect the right hand side of the curve will be more like a set of uneven stair steps, periods of sudden decline mixed in with periods when things go along fairly smoothly for a while. Most of us will feel the effect of declining energy supplies through the economy, which is our main interface with reality. But it is also interesting to consider the pervading role that fossil fuels play in our day to day lives. If you're uncertain how much we rely on fossil fuels, then just reach out and pick up an object that's sitting in front of you. Now consider the role that fossil fuels played in bringing that object to you. If it wasn't made locally using local materials, then the odds are that it's story is saturated with oil, natural gas and/or coal. I gather many people pretty much take for granted all the manufactured articles around them, and in a typical urban environment, that's pretty much everything around them. I've always had a keen interest in where things come from and how they are made, so the exercise suggested above really resonates for me. Let's just consider a few categories of things. One: over the last few decades we have globalized and thing tend to be made far form where they are used. Looking around me at the moment I don't see anything that was made locally from local materials, even if you stretch "locally" to mean within a hundred miles. Much of the stuff in this room was made in the Far East, half way around the world, just about as far away as it is possible to go and stay on the planet. Two: while I am retired and run a business out of my home, for most of my life I drove about 10 miles to work (one way). This is a very short commute. Most people drive much further to work each day. With things arranged like this, it's hard to reduce our dependency on oil for transportation. The infrastructure needed to produce consumer goods has largely been moved out of Europe and North America. Setting it up again would be a big job. Our cities have been set up to separate work spaces and living spaces and we haven't even begun to change this. Telecommuting sounds like a great idea, but it's not available or practical for most jobs. Fossil fuels play a major role in the production of our food today. This is not really evident to most of us, I think. Food comes form grocery stores, materializes on the shelves sometime in the middle of the night, right? Not. Most people in the world are fed by an industrial farming system that is critically dependent on fossil fuels. About seven calories of fossil fuel energy is needed to produce 1 calorie of food. Manual and animal labour has been replaced where ever possible by machines fueled by diesel oil or gasoline. The recycling of nutrients in plant, animal and human waste has been replaced by an open-ended system dependent on huge quantities of the three primary plant nutrients: nitrogen, phosphorous and potassium. The minerals phosphorous and potassium are mined and transported to the farm using fossil fuels. Nitrogen makes of 78% of our atmosphere, but to convert it into a form which is useful as a plant nutrient requires lots of pressure and heat, supplied by natural gas. The pesticides that are so integral to the process of industrial farming are also made from oil. And once the food leaves the farm it usually travels hundreds if not thousands of miles to get to us, in ships, trains, trucks and planes fuels by oil. Often, food is refrigerated the whole way from the field to your table, an incredible energy intensively process and mainly dependent of fossil fuels. The manufacture of many goods requires large quantities of heat, which is provided by fossils fuels. Metals, concrete, glass, plaster and drywall are just a few that come quickly to mind, even though none of them seem particularly oily. The internet, which is all about data, would seem to be exempt from this voracious appetite for energy, but nothing could be further from the truth. It is estimated to consume between 1 and 2% of all the energy used in the world. No doubt I have missed a lot of important, even critical things, but I think this gives you the general idea. Our modern society is dependent on oil and there is no cheap and effective substitute anywhere in sight.